Running a standalone event, the NASCAR Camping World Truck Series returned to Darlington Raceway after a 6-year absence. Assembling for the Too Tough to Tame 200, the visit to the so-called "Lady in Black" was the first time many of the younger truck series regulars to experience the 1.366 mile South Carolina race track. One of those drivers making the initial laps at Darlington was Timothy Peters piloting the #17 Red Horse Racing-owned Toyota Tundra. Fortunate for Peters, those early laps were fast enough to earn the #17 truck the pole position for the Saturday night event. Relishing the reputation for being the track too tough to tame, this race kept the track's slogan intact. In the first 10 laps of 147, the yellow flag flew on two occasions for spins involving the #92 of Dennis Setzer and Jason While in the #23 Dodge. White's truck would be the reason for caution again on lap 58 when the Mopar's engine suffered a terminal failure on-track. With 9 cautions 37 laps overall, a remarkably high number competitors within the NASCAR Camping World Truck Series had their will broken by the infamous oval. Topping the list of 16 vehicles that failed to finish the Too Tough to Tame 200 was Brian Ickler, Ricky Carmichael and Mike Skinner. Timothy Peters led the first 47 laps, reigning Camping World Truck Series champion Ron Hornaday would be the next driver to lead at Darlington. Five leaders would pace the Too Tough to Tame 200 with four of them leading more than 23 laps signifying how important gaining the lead was through the course of the event. The Richard Childress Racing #3 truck handled by Austin Dillon proceeded to lead after Hornaday up until lap 101 once the flag was brought under caution for an incident involving Mario Gosselin and Ricky Carmichael. Through the orchestra of pit road activity, the #30 truck of Todd Bodine was rushed into the lead by his crew. 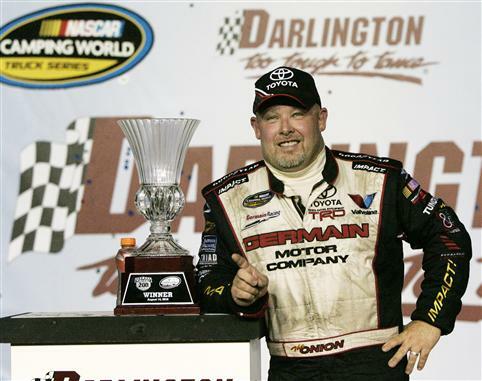 A deciding move for the event, Bodine and his Germain Racing #30 Toyota led the final 46 laps to win the Too Tough to Tame 200 at Darlington Raceway. Starting without intent to run a full Camping World Truck Series schedule, the #30 Germain Racing team were only even originally planning to run the race. However, by their lead positioning in the NASCAR Camping World Truck Series driver's standings the team arrived having to miss other previously-planned engagements including a wedding. After taking pole, Timothy Peters kept his #17 Toyota at the front for the entire event to score a 2nd place for a 1-2 finish for Toyota. Leading a charge of Chevrolet Silverado race trucks, Ron Hornaday finished 3rd ahead of Johnny Sauter and Austin Dillon rounding out the top five.